Even as a child, I’ve been fascinated by mosaics, and have recently discovered that it’s easy (although time-consuming) to create that effect with polymer clay. I always say that faux techniques can make the clay look like anything, and mosaics are no exception. The vase featured in this post was designed with five colors of metallic clay – bronze, copper, gold, 18K gold, and silver. After “grouting” with black clay and cured (baked), this piece was thoroughly sanded and finished with a spray-on coating to give it a little extra shine. It not only looks good, the satiny-smooth finish feels good! 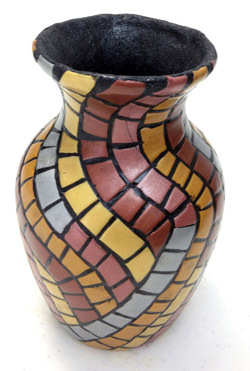 This vase is offered for sale in my new online shop, along with other finished items. More goodies of all types will be added over the next few weeks, so check out the shop periodically for new arrivals! Special Event – Classes at the Library! This Saturday, June 8, I will be teaching two classes on making the extremely popular European-style beads (disregard the price on the flyer – the library classes are free). These are the big-hole beads with the silver cores (grommets) lining the center opening, usually strung on snake chain bracelets or necklaces, but they also look really cool when paired with a leather cord. These beads are variously referred to as charm beads, memory beads, and the very famous Pandora brand beads. Colorful and easy to make, these beads invite creativity – swirl pretty colors together, cover with slices of decorative designs, or create a tiny sculptured bead. Your imagination is the only limitation! 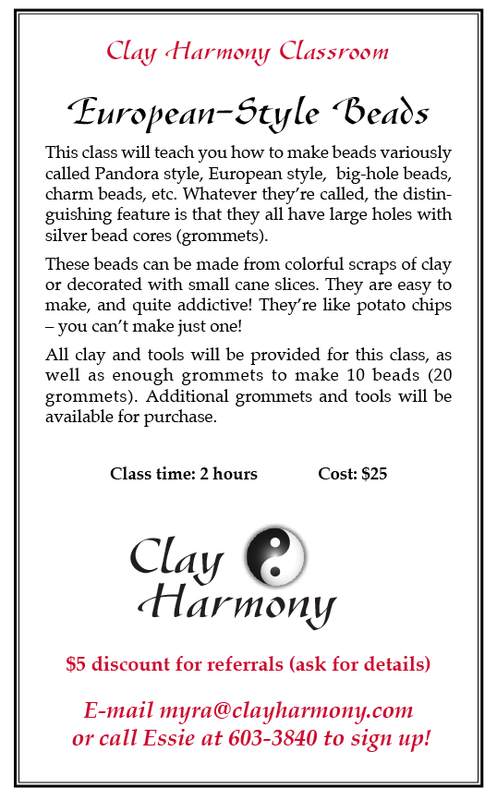 This class is perfect for beginners – no previous knowledge of polymer clay is necessary, and I provide all tools and clay to create 10 finished beads. 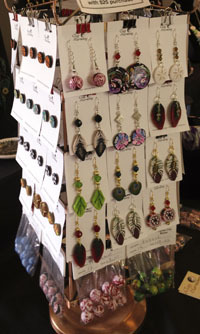 9 a.m.-noon and 1-4 p.m.
I’ve been so negligent in updating this blog – doing three craft shows back-to-back last December (and getting ready for them for some time before that) sort of threw me off-schedule! But things are getting back to normal now – I’m back to teaching more (see upcoming classes in the sidebar), and have only a handful of shows scheduled this spring. The biggest event happening soon is our guild’s annual retreat, April 11-13, 2013. It will be three days of nothing but playing in clay, learning new techniques, meeting new friends, and being inspired. I can’t wait! Our special guest this year will be Syndee Holt, a nationally recognized artist and published author from California. She will be teaching two classes at the retreat – Image Transfers and Four Fauxs (using polymer clay to imitate leather, turquoise, amber, and raku pottery). A good time will undoubtedly be had by all! Check out the retreat page on the guild website – lots of information there, as well as an online registration form. We’re filling up fast, so reserve your spot soon! 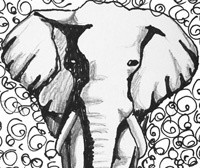 I happened upon a polymer clay tutorial the other day that blew me away – someone sketched an elephant on paper and then created a cane from it. It was in Russian, but the photos told the story even without translation. From one of the photos, the cane looked to be about 4″x7″. That’s a BIG cane, but the detail was awesome! Of course, it will be reduced to a much smaller size to be used in projects, but the simple method of constructing a complex image was what got my attention. And of course, it gave me some ideas, too. Seeing that tutorial was the spark for one of those forehead-smacking moments where I wondered, “Why on earth didn’t I think of it before?” I love it when that happens! When I get a chance to experiment with my idea, I’ll share the results with you. Until then, come have fun with us in my classes! The latest schedule is in the right sidebar. Hope to see you soon!